George Orwell's classic novel, Nineteen Eighty-Four, is essential reading for any truth seeker to understanding what is going on in America and the world today. This week on Visibility 9-11, Michael brings a special radio theater presentation of Nineteen Eighty-Four by NBC University Theater, first broadcast on NBC Radio Network on August 27, 1949. Let your imagination paint the picture of a totalitarian society in which mere thought is crime, the language is incrementally destroyed, information is strictly controlled, and torture is a means of control. 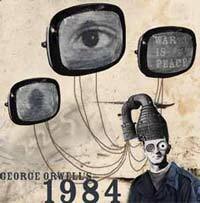 Many parallel's can and should be drawn between Orwellian society, recent world history, and modern America. Hence, a new understanding of the means and methods of control which are being implimented in America will follow. We can and must stand up against tyranny in its' modern form and preserve freedom and liberty for generations of Americans to come.